The local gardening group, ‘Pals with Trowels’ (I like to imagine they have an inner committee known as the Pollen Eight), organised a visit to Harlow Carr. 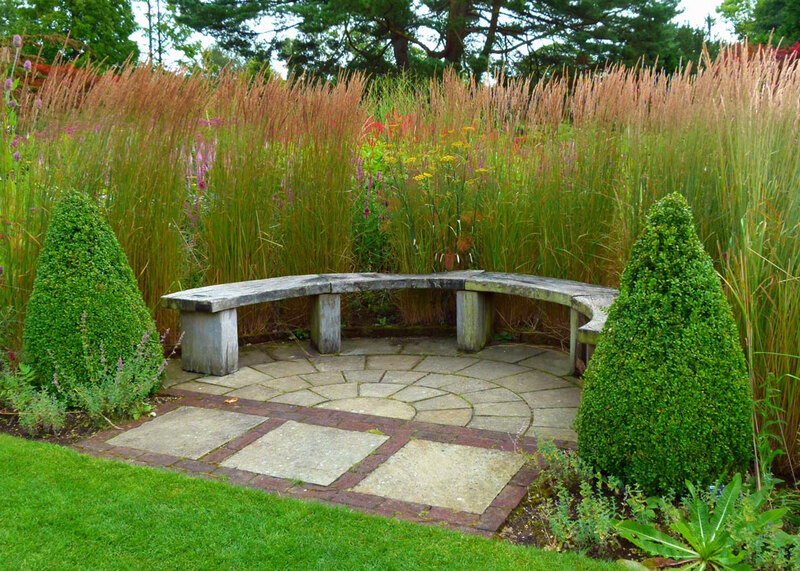 If you are a keen gardener, especially in Britain, and more particularly in the North of England, you will know that Harlow Carr is a public garden near Harrogate run by the Royal Horticultural Society (RHS). 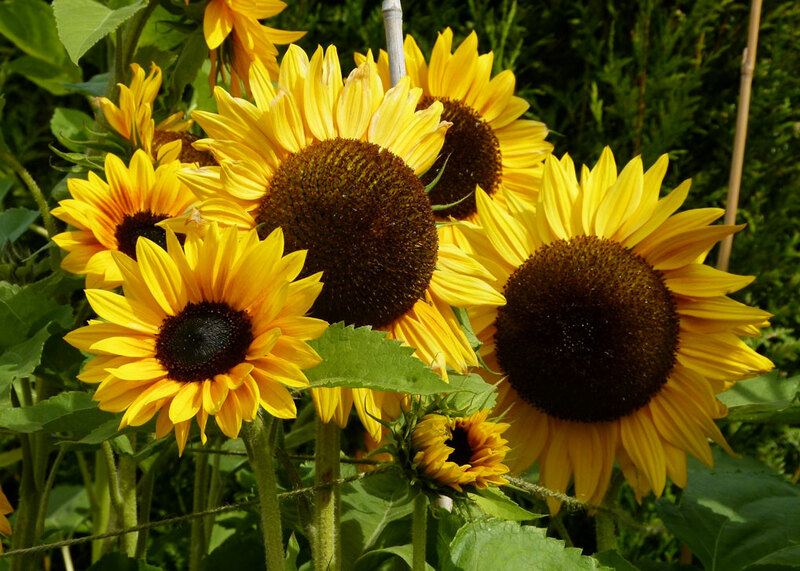 If you are none of those things, there is no shame in admitting that you’ve never heard of it; I hadn’t – I can barely distinguish a dahlia from a dandelion and my gardening skills are of the slash and burn variety. But I like gardens. 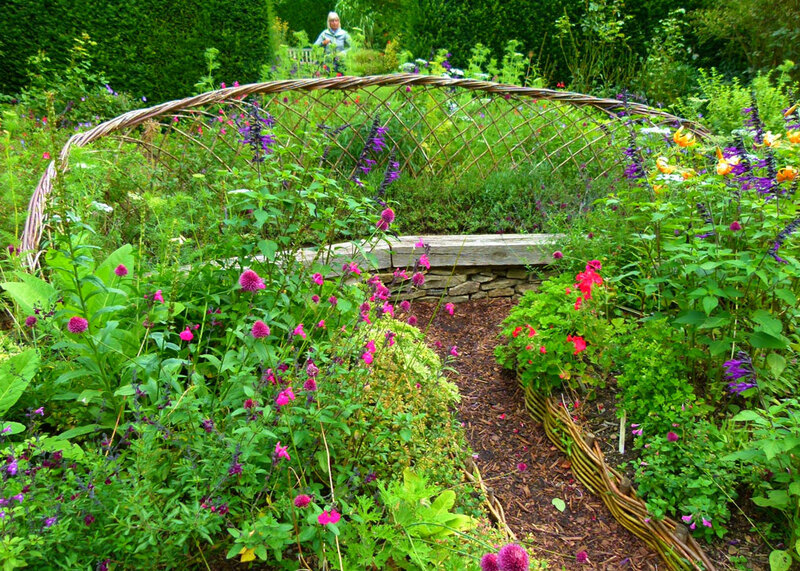 Indeed, there are few more agreeable ways of spending time than meandering through a pleasant garden, especially if you haven’t had to do any work on it. So when Mrs Britain mentioned that she and the other diggers with figures (for some reason, ‘the Pals’ appear to be almost exclusively female) were planning a trip to a famous garden I’d never heard of, I was happy to tag along. Besides, any visit is potential fodder for A Bit About Britain and the excursion came with the added enticement of a picnic. In fact, Harlow Carr additionally boasts a branch of Bettys Team Rooms (no apostrophe, apparently), the elegant up-market café brand of the Bettys and Taylors Group, based in Yorkshire. These are the people that bring you Taylors of Harrogate coffee and genuine Yorkshire Tea. Given that Yorkshire isn’t primarily renowned for its sub-tropical climate, which most mortals consider a prerequisite to enable flourishing tea and coffee plantations, I have always felt that Bettys and Taylors must be a pretty remarkable company. Anyway, the promise of a visit to Bettys increased interest no end, and a mixed party of at least nine set off in an assortment of carriages to see what Harlow Carr had to offer. 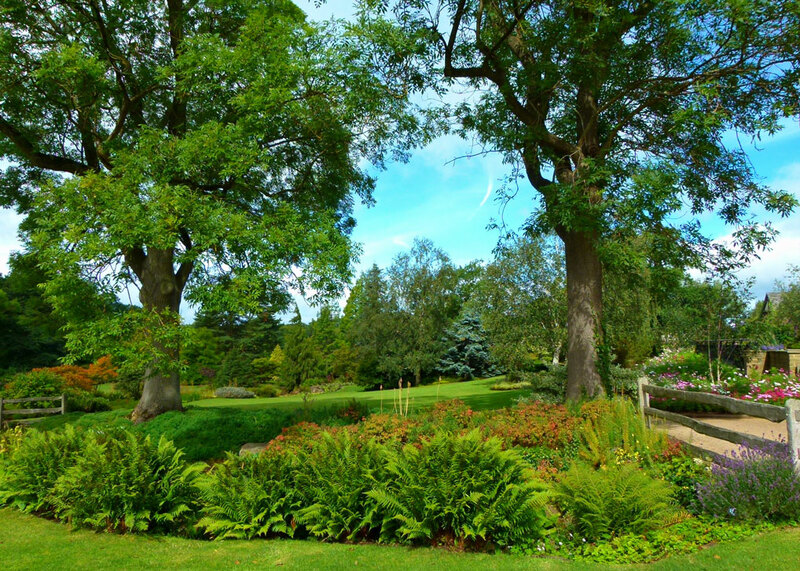 The gardens at Harlow Carr were developed on the site of a former spa hotel by the Northern Horticultural Society in 1950, when they leased 26 acres of mixed woodland, arable land and pasture from Harrogate Corporation. The main objective, apparently, was to see how various plants coped with the challenges presented by northern English weather. You may wonder why they didn’t simply talk to the owners of already long-established gardens in the frozen north, including Scotland (“How are your coffee plants doing this year?”), but I gather the approach was a little more scientific than that. 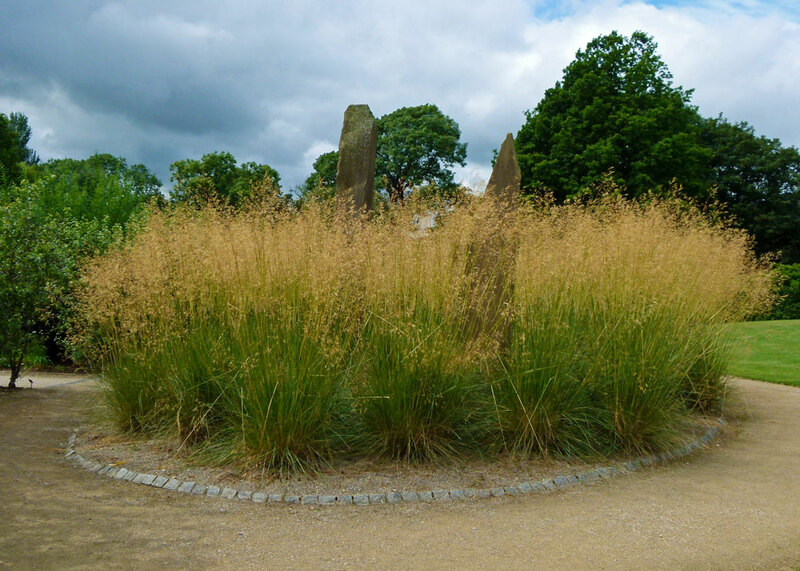 Eventually, in 2001, the Northern Horticultural Society was grafted onto, or was overgrown by, the Royal Horticultural Society; thus the place is now called RHS Garden Harlow Carr. 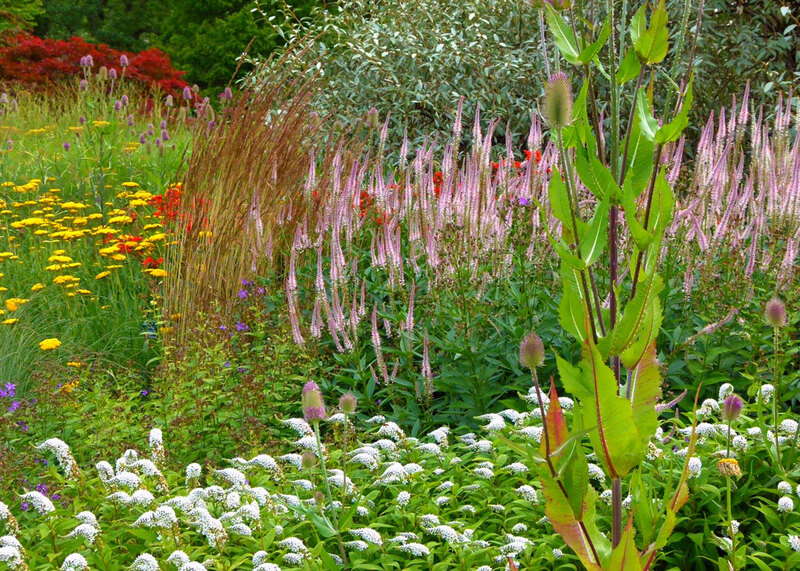 Harlow Carr has come on in spades since the NHS set out to assess the North’s ability to sustain plant life. It now covers an area of 68 acres, which is quite enough for the average Flymo, has three car parks and the inevitable gift shop as well as – and this will surprise you – a plant shop. Some of us felt unable to face the rigours of trekking through luxuriant foliage without a coffee first; and, to be fair, no one needed much persuasion. 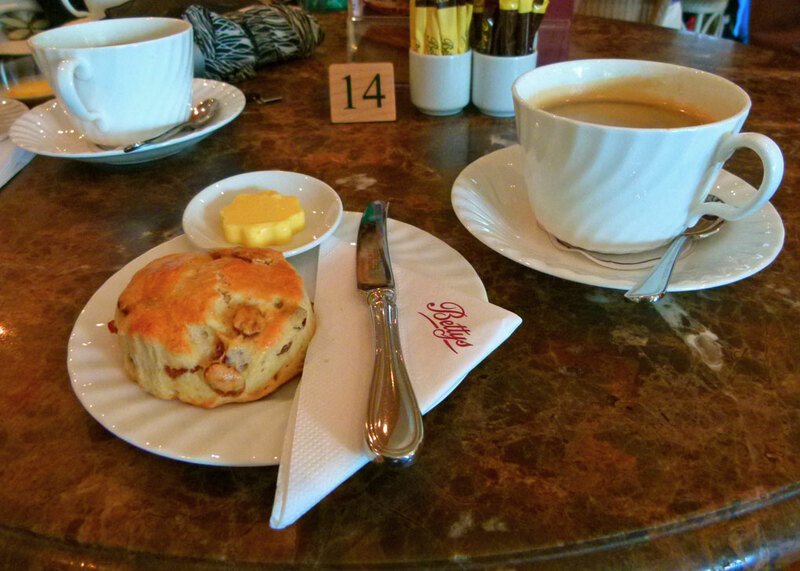 This was my first experience of Bettys and I liked it very much. It was open, clean and attractive. Tempting cakes and other morsels were thoughtfully displayed in glass-fronted cabinets. Strategically placed potted fronds added to an atmosphere of by-gone gentility (actually, I prefer anemones, but with fronds like that, who needs them?). Suited gentlemen showed us to a vacant walnut-veneered table, where we sat in wicker chairs and were waited upon by unpretentious, cheerful, polite, neatly attired waitresses. In contrast, some of the clientele looked distinctly scruffy; I do wish people would make more effort, don’t you? Though we had but a snack, my coffee and scone were perfect and I noted that the menu offered a broad choice without being unrealistically huge in scope (always a bad sign, I feel). And it was reasonably priced, considering – though it’s not the place for a cheap bacon butty and a mug of tea. 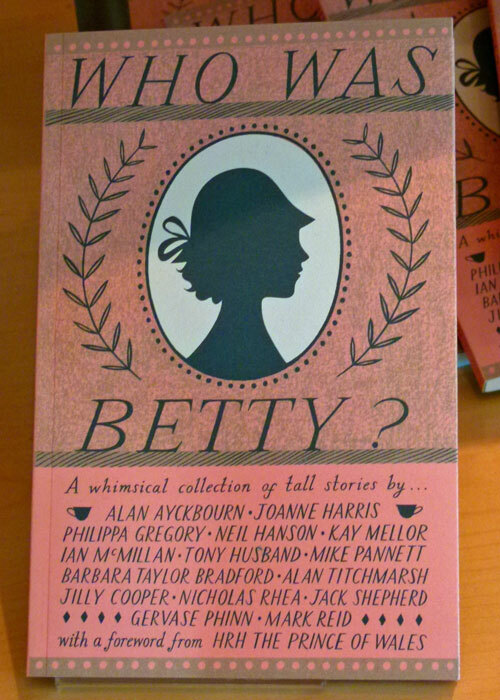 As a footnote, apparently, Betty’s identity remains a mystery; in itself an interesting piece of marketing. A blow by blow account of touring Harlow Carr would be tedious, and anyway the garden ingeniously produces different things at different times of the year. So I merely present my inexpert observations and a selection of photographs from our visit in late summer. Generally, I admire but am not over-fond of highly formal gardens with symmetrical, rigid, displays. Harlow Carr is not like that. It offers a kind of organised informality; your head tells you that it takes a considerable amount of thought in design and effective management to achieve that. So you get borders packed with colour that are obviously not natural, but which look just right. There are perfect vistas that nature had little hand in. 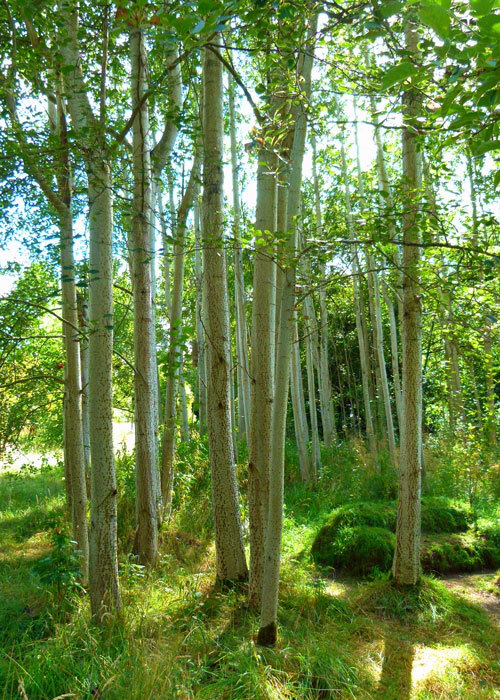 An arboretum which is evidently planted, yet seemingly uncontrived. 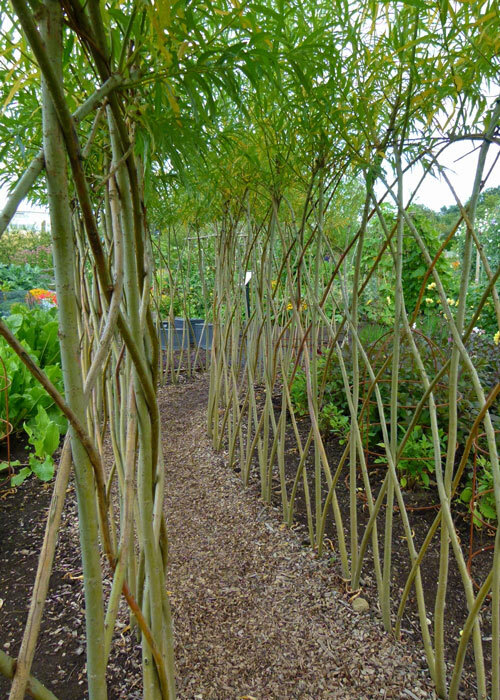 A kitchen garden, where you would expect a certain necessary formality, with homely willow-wand paths and contrasts of colour. Even a little touch like a wrought-iron and wire teapot, some 5 feet across, festooned with flowers by the tea house, looked as though it belonged. 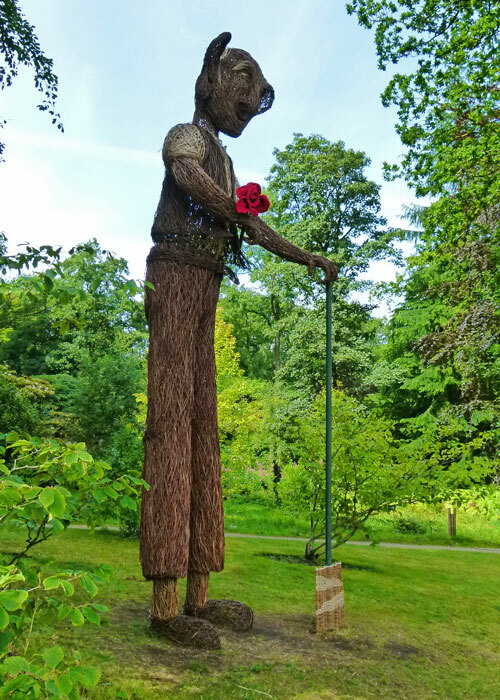 It was fun, too, to spot an effigy of Roald Dahl’s BFG through the trees and then come upon him later with an enormous spade nearby. Curiously, these alien features blended in as well. A piece of inspired thinking has resulted in children’s play areas being sited, not adjacent to the entrance, café and shop, as is painfully often the case, but tucked away in discrete woodland areas. At Harlow Carr, the kids have to work for their pleasure like everyone else and their shrieks of delight are reasonably muted by distance and undergrowth. One feature is a slide disguised in timber called ‘the Logness Monster’ – terrific. The sulphur springs upon which the old spa had been based were capped ages ago, but apparently the odour occasionally seeps out. So I did think that the accusing look I received from a haughty woman in tweeds as we passed by close to where the springs are located was unjustified. Well, I assume it was the springs. Eventually, after several hours of walking, stopping, starting, a break for a picnic (very nice, thank you) and a shorter pause for a cup of tea, Pals with Trowels and friends found themselves, as if by magic, near the exit outside the plant shop (which the RHS euphemistically calls a ‘plant centre’). There was a certain amount of debate along the lines of, “Of course, we don’t really need anything, so I won’t be buying…” when, as if by osmosis, we found ourselves inside the emporium. I distinctly heard pleasurable cooing noises coming from several of my companions and I have to say that even I was impressed, dragging Mrs Britain off to look at some particularly beautiful roses. Interestingly, RHS plants come with a five-year guarantee; I suppose this covers parts and labour, but it probably excludes excessive attention from the feral cats that frequent our little patch at home. Still, the chocolate mint has survived so far. But we may have to revisit Harlow Carr anyway, just for the pleasure of it. What do you think? Good review – I enjoyed my visit yesterday, though maybe not as much as you enjoyed yours. Not so many flowers in winter! Hi Mike. Thank you for visiting my blog and liking my post about hill figures! I thought I’d pay your blog a visit and I came across this lovely post. Oddly enough, my husband and I visited Harlow Carr in the summer and it’s on my list of posts for writing up (I have dozens lurking about several computers and memory sticks!) I intend to do a separate post about Betty’s Tea Rooms, too. 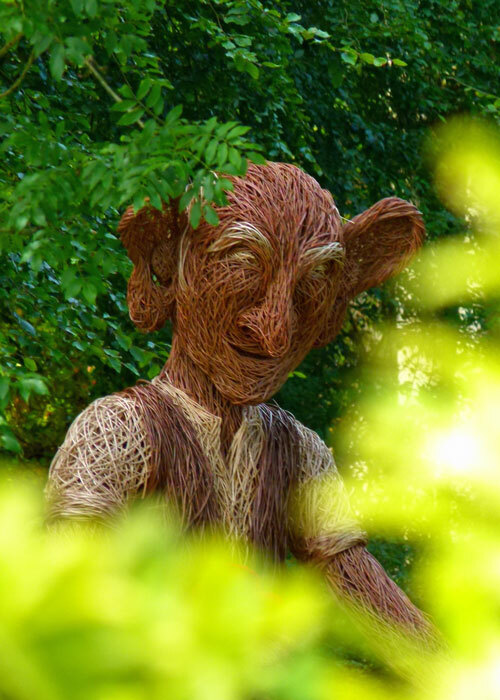 We’ve been to all three of them now (Harrogate, Harlow Carr and York) and thought I’d write about the history behind them. Like you, we travel extensively in Britain, and I try to post about as many places as my time allows. This year has been chaotic, hence the backlog. Only recently I posted about another Gardens in Yorkshire (Burnby Gardens) so had intended to leave Harlow Carr for a while. We’ll see. Your photos are lovely. 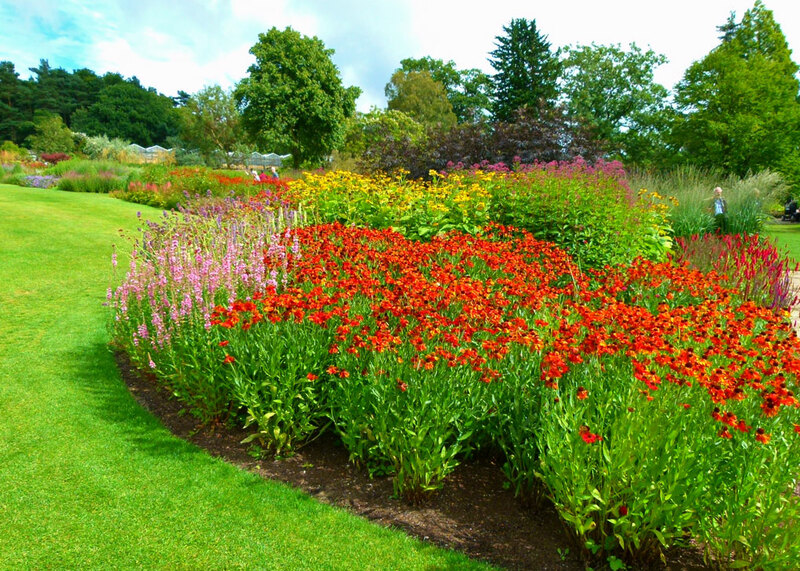 I agree that Harlow Carr is a wonderful place to visit – so colourful. Have a great weekend, Millie. I like your comment about any trip being potential fodder for “A Bit About Britain.” I’m amazed at the way writing a blog has changed my view towards everyday life and big (or little) excursions. I hope you and Mrs. Britain have a great weekend! Hi Mike – oh gosh yes … another post with further details. What an amazing place to see and read about … and you’ve sent me off on another blog post – thank you! We grow tea in Cornwall … though I don’t live there … I feel Cornish (almost)! Happy memories of a smashing day. More comments about refreshments than plants but this is a true reflection of the day! When selling packets of Yorkshire Tea in York I always said, if asked, that it was grown on the southern slopes of the Harwardian Hills. In spite of having spent every summer holiday for the past 13 years near Harrogate, I’ve not yet made it to Harlow Carr. Something to put on my list for summer 2017! Also, I’ve never been to Bettys; whenever I’ve walked past the shop in Harrogate, it was either closed or a queue outside, and I’m really not prepared to queue for a cup of tea and a scone with so many other nice cafés around. Looks like the branch of Bettys at Harlow Carr doesn’t have that problem, good to know! I loved this post!! I am a flower farmer 😉 so this is up my alley. You did a great job capturing the garden in your photos. 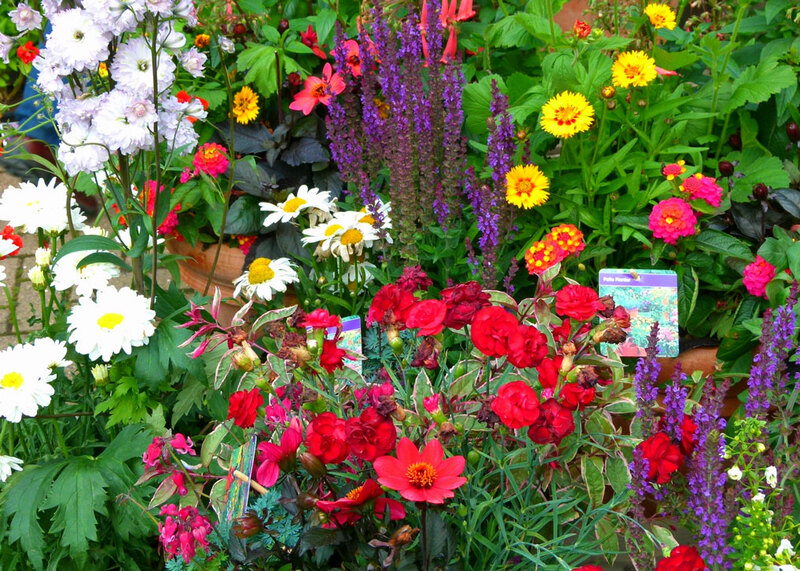 Fabulous looking garden! I like the “organized informality”, the sulptures, and the coffee – put together it sounds like my kind of garden. Sadly we weren’t aware of it when we stayed in Harrogate and had tea at Bettys original tea room, but if we were returning, it would be on our list. Glad you enjoyed it. Great photos, I love wandering around gardens like that if they are not too busy, even on my own, but all my hill walking friends aren’t the slightest bit interested and think I’m weird. I just like colour and lush surroundings especially if they go against the prevailing climate and present something out of the ordinary. Very punny! Also, what gorgeous color. All in all, a most satisfactory day I imagine. Had a giggle reading all your puns! I enjoyed this very much and would love to visit Harlow Carr and Bettys. 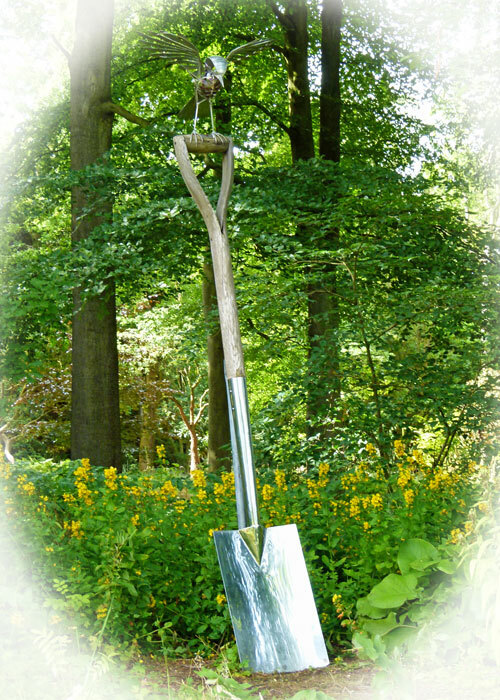 I love gardens and this one is just the kind I like, not too formal and doesn’t take itself too seriously.. Love the name Pals With Trowels. I visited in 2006 and always wanted to return. I think it must have changed since I was there, or at least they certainly didn’t have the BFG then! But it was a really beautiful garden, and I think I probably even prefer it to Wisley Garden, their main one, which is set amongst beautiful wood and heathland in Surrey. 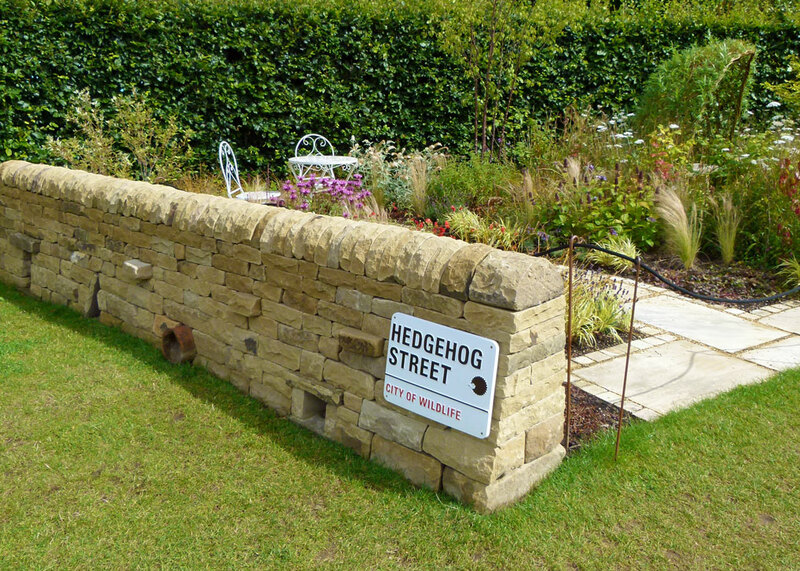 Oh my – Hedgehog Street – just love this photo! 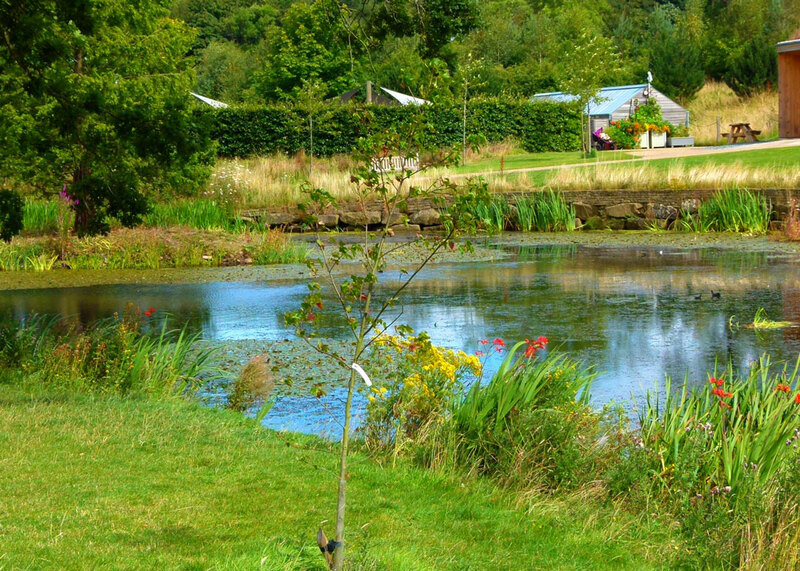 If ever I am near Harlow Carr it will be on my list of places to visit. Your post here, and other blogging friends have talked about it, and it looks so very nice in your photo’s. Plenty to see and lovely walks to be enjoyed. Excellent review from a non-gardener 🙂 Haven’t been to Harlow Carr for about 5 years so am definitely overdue a visit, thanks for the reminder of how lovely it is. 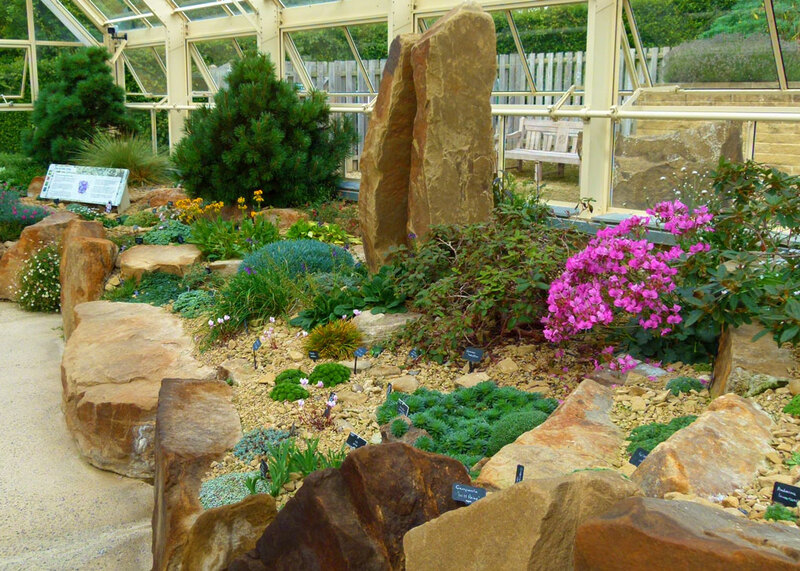 I was delighted to see your post as I, too, visited Harlow Carr for the first time this year. 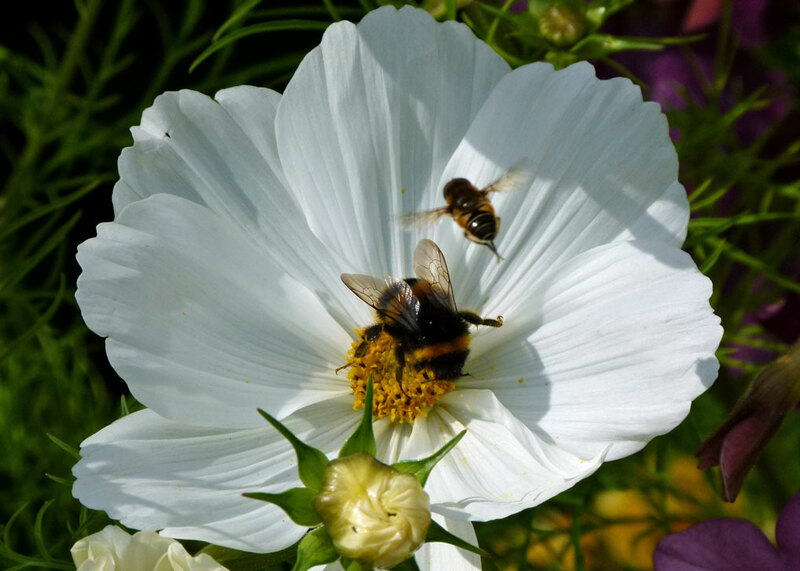 Mine was an early Spring visit so what a pleasure to see your photos of Summer in the garden. 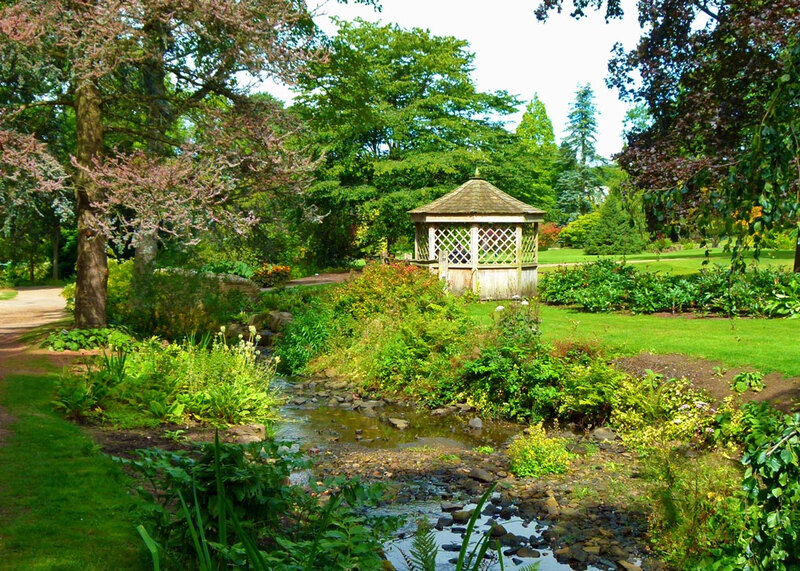 I loved the size of the garden, just perfect for wandering around and the added treat of tea and cake at Bettys was an added bonus. Sounds like a thoroughly enjoyable excursion with lots to see and lots of time to pause and eat. The gardens were beautiful. I’ve never been to Harlow Carr in spite of the fact that my parents lived practically opposite it for 20 years. It’s one of those things I always intended to do. Thanks for sharing. Was England born in Athelney?